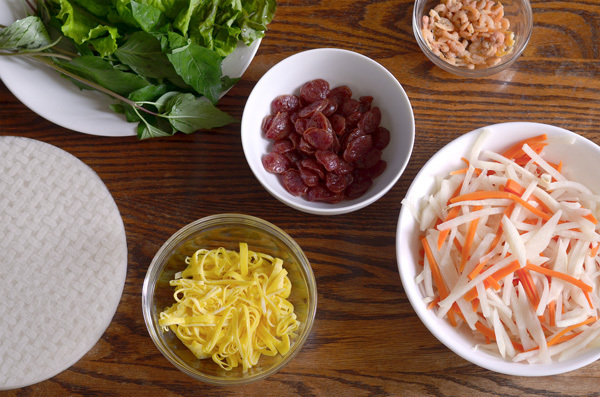 The name bò bía is likely a Vietnamese adaptation of the Chinese roll “popiah.” These two foods are quite different though. 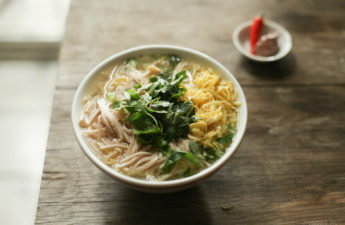 It’s plausible to think bò bía was adapted by the Vietnamese and ingredients were substituted with what was available. 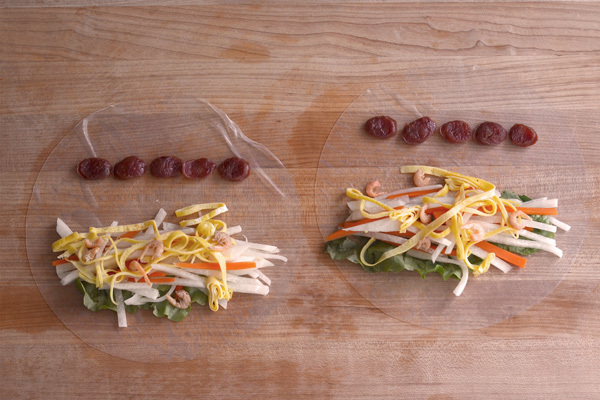 The first noticeable change is the Vietnamese use a rice paper wrapper instead of a wheat-based one. 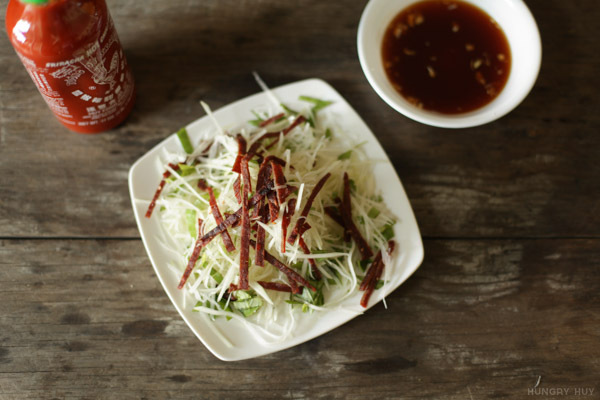 Other changes include the sauce and removal of ingredients like yams, green beans, and bean sprouts. Popiah also has fried variations. 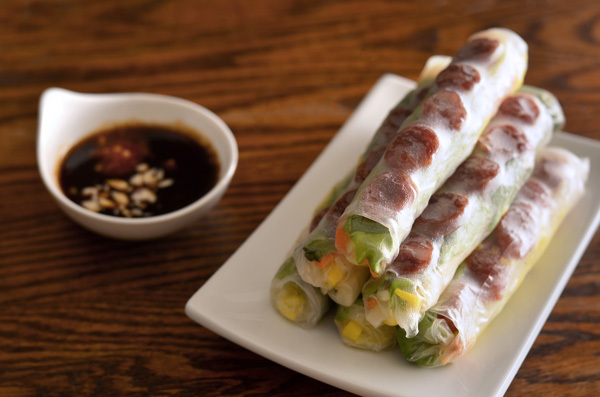 Bò bía is a fresh type of spring roll, packed with vegetables. 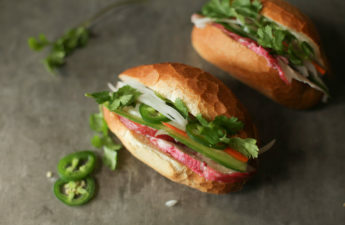 Despite containing Chinese sausages, these rolls are fairly light, so you can eat a ton of em! Or ya know for easy snacking. They aren’t typically served as full meals, but if you have 3 of them like I just did, you can forget about eating anything else. My mom clearly recalls that in Vietnam, these rolls never had carrots in them for the same reason dồ chua didn’t–it was too expensive. Even though bò bía is designed as portable food, she says most of them were eaten at the stand where they’re made. How fun does that sound? Since these were simple street snacks, vendors didn’t fuss with any sauce containers. Any on-the-side extras we’re used to Stateside were usually put directly into the roll. When business was slow, these rolls would slightly dry out, so the cart owners would revive rolls by dipping them in the hot water used to steam the veggies. Clever! Start with the dried shrimp since it takes the longest. The typical way to use this is to soak it in water. This takes around 2 hours if you use hot or warm water, or you can soak overnight to prep for this recipe. We soak it so they’re not super hard to chew. Next we start peeling and julienning jicama and carrots. I didn’t want carrots to take over in these rolls so I went with about four times as much jicama as carrots. Add salt and water, bring to a boil and then reduce to a low boil for about 15 minutes. We want them to be softened but still retain a slight crunch. Steaming would be a better way to cook these since you can control it better, but I don’t have a steamer. Meanwhile, whisk together the eggs and season with a little salt. Heat a pan and pour a thin layer of the eggs on to cover. We want it thin enough so there is no need to flip the egg. This means you might need to do 2 or more batches. 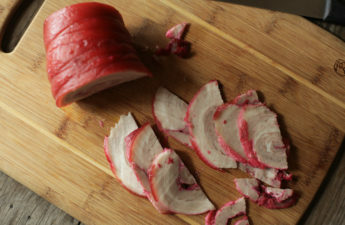 Then roll it up and cut into ribbons. 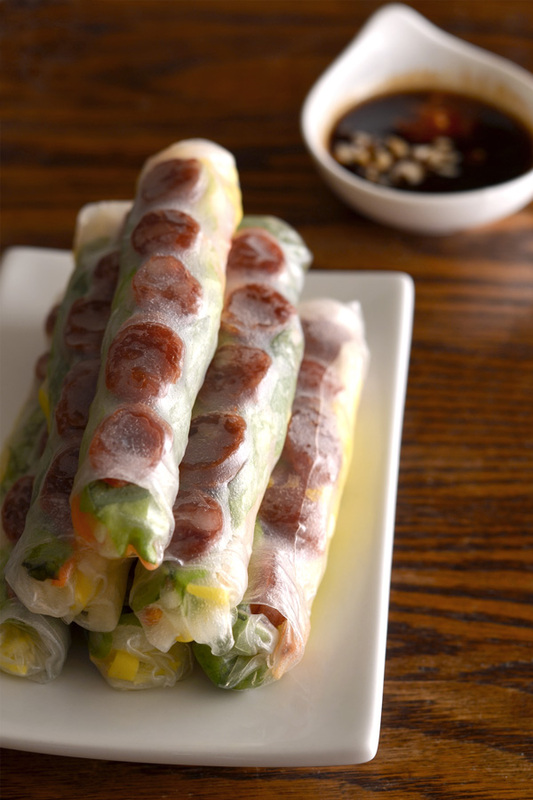 For the Chinese sausage (lạp xưởng), slice at an angle so the pieces are longer and look nicer in the roll. You can also cut it lengthwise but I don’t like the fact that each piece isn’t going to be uniform. Saute on medium heat and flip until lightly browned on both sides. These sausages have a lot of fat that will render, so if you cook it too much they will shrivel. To keep the shape of the sausage you can also bake or boil it (which my mom prefers). Wash and dry the mint and red leaf lettuce. To roll, start with mint, a small piece of lettuce to cover the length. Add jicama and carrot, egg, shrimp, and sausages. I was determined to make a plumper roll so I loaded up on the filling. With this smaller sized rice paper (22 cm), it was harder to roll, but I made it work. If you want to one-up my method, make your rolls about an inch shorter or use larger rice paper. The dipping sauce I used (recipe below) is more concentrated and has crushed peanuts on top. I used sambal chili paste on top. Just add peanut butter if you like it creamier and adjust the consistency by adding water. Nomnom… that’s a wrap. This makes about 8-10 rolls, depending on size. This recipe easily doubles. 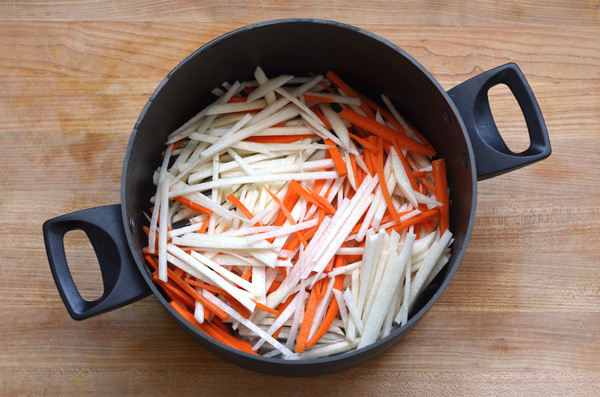 Peel and julienne jicama and carrot, add to pot with 2 tsp salt and 1 cup water. Bring to a boil on high, then reduce to very low boil for about 15 minutes or until soft but slightly crunchy. Whisk eggs to combine. Make a thin omelette in a non-stick pan on medium heat. Split into 2 batches if necessary. Roll up and cut into ribbons. Wash and prep the vegetables. 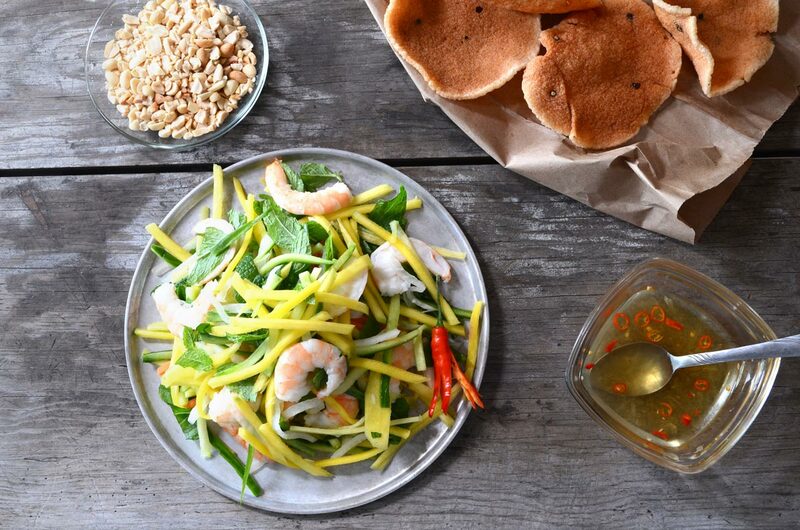 Dip rice paper into a plate of warm water for about four seconds to soften. It will soften more after you remove it from the water. Assemble ingredients (as shown above) with a little bit of each ingredient. 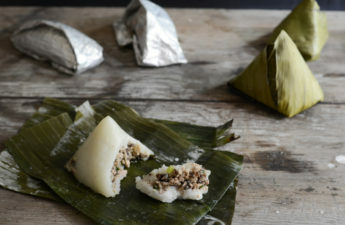 Love the stories behind the food, traditions about using (or not using) certain ingredients, cultural background of food. Always learning something new. Hey Julia! Learning that kinda stuff is something I pretty much need to do. 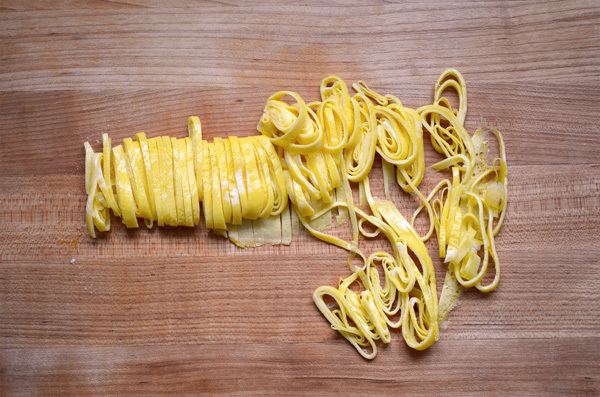 It’s fun and really makes me see food differently. 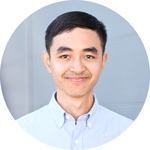 would you believe, my significant other doesn’t like lạp xưởng? this isn’t something we ate much of, i’m not adverse to it as i do like it, but it’s just not something that i even think of to order to eat. Come to think of it, I don’t think I’ve ever ordered this at a restaurant. It’s always been something we cook at home. Thank you for this recipe. I couldn’t find my moms’s so I used this as a guide. Very yummy!!! What’s anatto seeds,the ones that give the color to BBH ( what ‘s the Vietnamese name ? Spot on! In Vietnamese they’re called hat dieu.